If missing teeth have left you feeling too self-conscious to smile, we are pleased to offer high-quality dental implants that can rejuvenate your appearance and boost your self-confidence. Also considered synthetic tooth roots, implants are composed of a titanium screw and a post that is covered with a fixed restoration such as a bridge, crown or denture. An implant is secured into the bone adjacent to your other teeth. 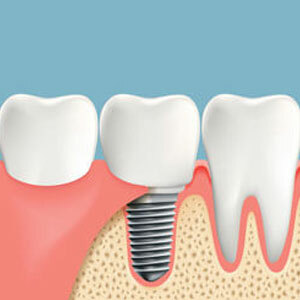 After several months, the implant fuses to the bone, so it looks and functions like a natural tooth. According to some studies, 98% of implants last for the life of the patient, making them a fantastic investment. We can replace a single tooth or an entire mouth, depending on your needs. Both the ADIN and the Straumann dental implant systems are used in the practice. Dental implant treatment at First Dental Studio is divided into a surgical phase and a prosthetic stage. The surgical phase involves placing the implant into the jawbone and doing any necessary bone grafting. The prosthetic stage includes making the crown to go onto the implant once the implant has integrated with the jawbone after approximately three months. All our dentists can carry out the prosthetic phase of treatment. Usually, a patient comes to us with an implant that needs to be restored with a crown, or we refer a patient to a specialist to have the surgical phase of treatment and have them back for the prosthetic phase. Dr Vincent Wan can now do both the surgical phase and prosthetic phase of treatment. Being able to have both phases taken care of at our practice is particularly convenient for patients who don’t have to go somewhere else for the surgical phase. It’s also less expensive than having treatment performed by a specialist. If a particular case is complex, however, we still use a specialist. When a tooth is removed, the bone in which the tooth was sitting tends to resorb, and you lose the bone. Dr Wan places a bone graft straight after removing a tooth to preserve the bone so an implant can be placed there later. If there isn’t enough bone, we cannot place an implant into the site. Sometimes we remove the tooth and put the implant into the site as well as a bone graft if needed at the same sitting. Cone beam CT scans allow us to analyse how much bone is available and its closeness to vital structures like nerves and sinuses. Book a Consultation to See If Implants Are Right For You! If you’d like to enhance your smile with dental implants, contact First Dental Studio to schedule an appointment!